Many plant species or genera living in the temperate forests of East Asia now have fragmented distributions closely linked to past climate oscillation. Repeated forest fragmentation can not only lead to allopatric divergence of species, but also give rise to speciation. Many biological factors, such as hybridization and polyploidization are also considered playan important role in these speciation processes simultaneously. The East Asian endemic genus Rodgersia comprises five species and several variants. These species exhibit variation in ploidy level and a fragmented distribution across the whole of East Asia. In order to explain their present distribution pattern under a robust phylogeny, Prof. SUN Hangs group from Kunming Institute of Botany, Chinese Academy of Sciences (KIB/CAS) employed multiple copy nuclear genes (ITS and ETS), cpDNA (rpl32-trnL, trnV-ndhC, ndhF-rpl32) and a low copy nuclear gene (GBSSI) to reconstruct the species’ relationships within Rodgersia and the historical biogeography of this genus. Identification of ploidy levels was also carried out for most of samples. 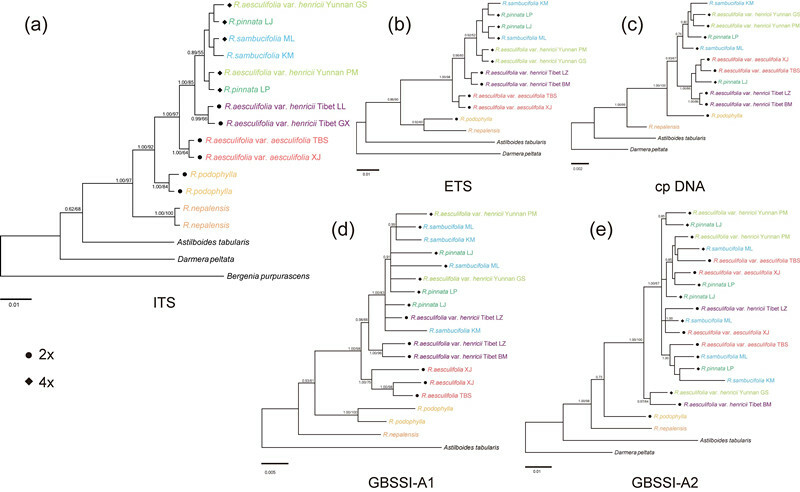 The early-diverging position of R. nepalensis was confirmed in different gene trees. R. podophylla distributed in Japan, on the Korean peninsula and in northeast China was sister to the rest of the species. The species on both sides (R. nepalensis and R. podophylla) diverged from the other species successively, suggesting that a widespread ancestral species’ range might have existed. R. nepalensis and R. podophylla share many specific sequence characteristics, which also support that a widespread ancestral species’ range was existed. Two putative vicariance events were revealed by the reconstruction of geographic range evolution (Fig. 3), which indicated the allopatric speciation of R. nepalensis and R. podophylla respectively. Rodgersia represents a rare example in which two early-diverging species occur at opposite ends of the distribution area. Divergence time estimations showed that vicariance events of Rodgersia may be shaped by Pleistocene forest fragmentation. Researchers have also revealed the reticulate evolutionary history of the species in the central area by comparing different gene trees (Fig. 2). Reticulate events, along with polyploidization, had resulted in rapid diversification of the species in the central area. The rapid evolutionary changes of the species in the central area accelerated allopatric divergence of the species on both sides simultaneously. This research was supported by the Major Research Plan of National Natural Science Foundation of China (NSFC) National Science Fund for Young Scholars and the Strategic Priority Research Programof CAS.